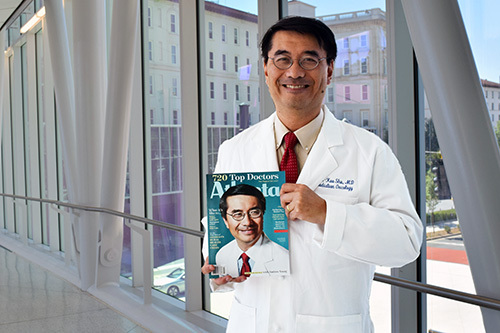 Winship radiation oncologist Hui-Kuo Shu, MD, PhD is featured on the cover of this year's Atlanta magazine "Top Doctors" issue. Read feature article. Fifty-one Winship members are recognized in this year's Atlanta magazine "Top Doctors" issue released on June 22. Among them, Winship radiation oncologist Hui-Kuo Shu, MD, PhD is one of four local physicians featured on the magazine's cover. As our Emory Healthcare family continues to grow, so too does our ability to provide Atlanta and Georgia residents access to more top health care providers. Atlanta magazine's July 2017 Top Doctors issue features the annual listing of Top Doctors in the metro Atlanta area. We are proud to announce that of all the health systems represented in the list, Emory physicians make up half of the doctors – 50% of 2017 Atlanta Top Doctors to be exact. To compile the annual "Top Doctors" list, Castle Connolly uses a survey and research process involving tens of thousands of top doctors across America and the medical leadership of leading hospitals. Atlanta's top doctors are selected after peer nomination, extensive research, careful review and screening by Castle Connolly's doctor-directed research team. Atlanta magazine uses the research by Castle Connolly to provide detailed information about education, training and special expertise of Atlanta doctors. Doctors do not and cannot pay to be selected and profiled as Castle Connolly "Top Doctors."